Here is another quick and tasty recipe from are friend and fellow cook, Vinie from Brooklyn, New York. Stir in one 16 oz can of tomato sauce, one 16 oz. jar of salsa, 1 can of red kidney beans, one packet of McCormick Chili seasoning mix. Add a cut up jalapeño pepper if you like it hot,and we sure like it Xtrema Hot!! Add one cut up red pepper and one cut up green pepper. You can serve this with either white rice or tortilla chips. 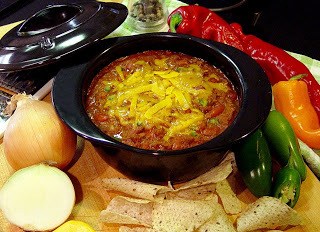 We hope you enjoy this Xtrema Chili!! Think Xtrema for Healthy Cooking and Healthy Living! !